18 Samuel was ministering before the LORD, a boy wearing a linen ephod. 19 His mother used to make for him a little robe and take it to him each year, when she went up with her husband to offer the yearly sacrifice. 20 Then Eli would bless Elkanah and his wife, and say, "May the LORD repay you with children by this woman for the gift that she made to the LORD"; and then they would return to their home. 21 And the LORD took note of Hannah; she conceived and bore three sons and two daughters. And the boy Samuel grew up in the presence of the LORD. 22 Now Eli was very old. He heard all that his sons were doing to all Israel, and how they lay with the women who served at the entrance to the tent of meeting. 23 He said to them, "Why do you do such things? For I hear of your evil dealings from all these people. 24 No, my sons; it is not a good report that I hear the people of the LORD spreading abroad. 25 If one person sins against another, someone can intercede for the sinner with the LORD; but if someone sins against the LORD, who can make intercession?" But they would not listen to the voice of their father; for it was the will of the LORD to kill them. 26 Now the boy Samuel continued to grow both in stature and in favor with the LORD and with the people. This is the origin story of Samuel. 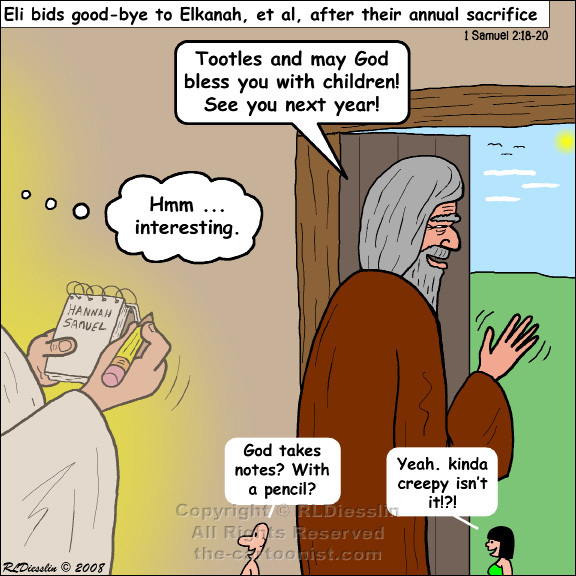 Verse 2:21 gives a quick recap of Chapter 1 where Hannah, who has been barren to that point, is praying for children. Sound familiar? She makes a vow that if God grants her children, her first will be dedicated to the LORD (raised in the temple) and essentially grow up as a servant to Eli. This has already happened by this passage, but is recounted and contrasted with Eli's own kids, who were derelicts. Samuel on the other hand grows "both in stature and in favor with the LORD and people." More than just a contrast to Eli's kids, Samuel is becoming a worthy successor to Eli. Not only is God smiling on him, but the people also like him.